Hamilton City Council Reservoirs are all unmanned plant, except for the Waters Operations Team undertaking physical sampling and plant checks. The processes that occur at each reservoir are closely monitored remotely by the Ops Team on the SCADA system in the central control room. A crucial link in monitoring the various sites is the communications network, which is achieved through Radio and microwave technology. Each Reservoir transmits data packets supplying the Ops Team all the information relating reservoir and network Flow, Pressure, Levels, pH, Chlorine, Turbidity, Pump Speeds and so forth. The essential equipment handling the data transmission is housed in Network Cabinets. 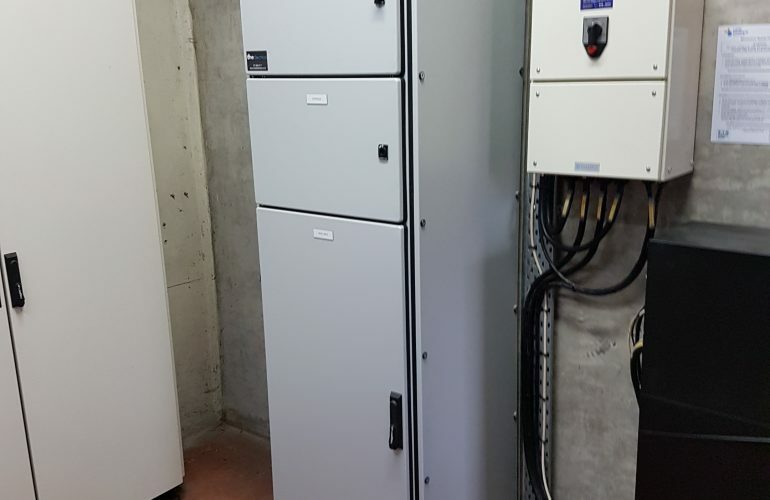 We liaised with HCC for upgrades to the reservoir Network Cabinets at the Pukete and Newcastle Reservoirs, in Hamilton. The custom design of these cabinets, which include 230VAC, 12VDC, 24VDC, 48VDC Distribution and Battery Backup, Power Supplies, Repeater, Microwave and Ethernet components, ensure that this hardware is dust-free, ventilated, and appropriately secured. Our IP Rated free standing Network Cabinets incorporate Cable Glanding and Management, Lighting, and a full hinged side door facilitating easy access for maintenance and additional works. Further, we believe component reliability is enhanced due to the clean environment. These network cabinets are now a structured assembly of clean equipment, and secured cables that are glanded and labelled. The chance of unexpected shutdowns due to inadvertent pulling of cables while undertaking works is greatly diminished, overall providing a more reliable solution to the HCC for this essential equipment. As a company we take pride in supporting the community that we work in.